For the crust: Adjust an oven rack to the middle position and heat the oven to 325°. Process the graham cracker pieces in a food processor to fine, even crumbs, about 30 seconds. Sprinkle the melted butter and sugar over the crumbs and pulse to incorporate. Sprinkle the mixture into a 9-inch springform pan. Press the crumbs firmly into an even layer using the bottom of a measuring cup. Bake the crust until fragrant and beginning to brown, 10 to 15 minutes. Let the crust cool to room temperature, about 30 minutes. For the filling: Meanwhile, increase the oven temperature to 500°. Beat the cream cheese in a large bowl with an electric mixer on medium-low speed until smooth, 1-3 minutes. Scrape down the bowl and beaters as necessary. Beat in half the sugar and salt until incorporated, 1-3 minutes. Beat in the remaining sugar until incorporated, 1-3 minutes. Beat in the sour cream, lemon juice and vanilla until incorporated, 1-3 minutes. Beat in the egg yolks and eggs, two at a time until combined, 1-3 minutes. Being careful not to disturb the baked crust, brush the inside of the prepared springform pan with 1 tablespoon of melted butter. Set the pan on a rimmed baking sheet. Carefully pour the filling into the pan. Bake the cheesecake for 10 minutes. Without opening the door, reduce the oven temperature to 200° and continue to bake the cheesecake until the center of the cake registers 150° (about 1 1/2 hours). Transfer the cake to a wire rack and run a knife around the edge of the cake. 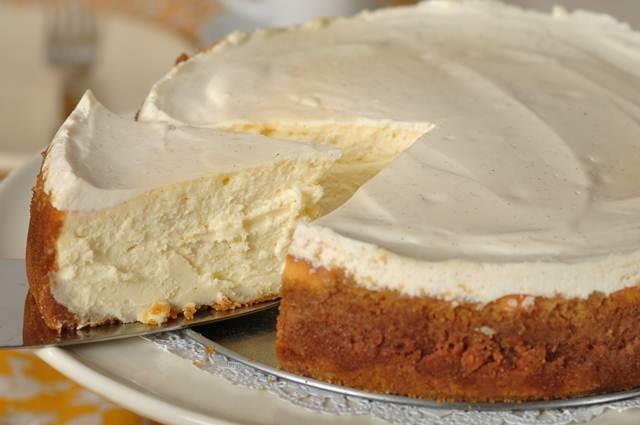 Let the cheesecake stand until just barely warm, 2 1/2 – 3 hours. Chill until ready to eat. Serve as is or with Strawberry Topping.